The Big 3. For a time, they were the last men standing in the American motorcycle industry: Harley-Davidson, Indian, and Excelsior-Henderson. 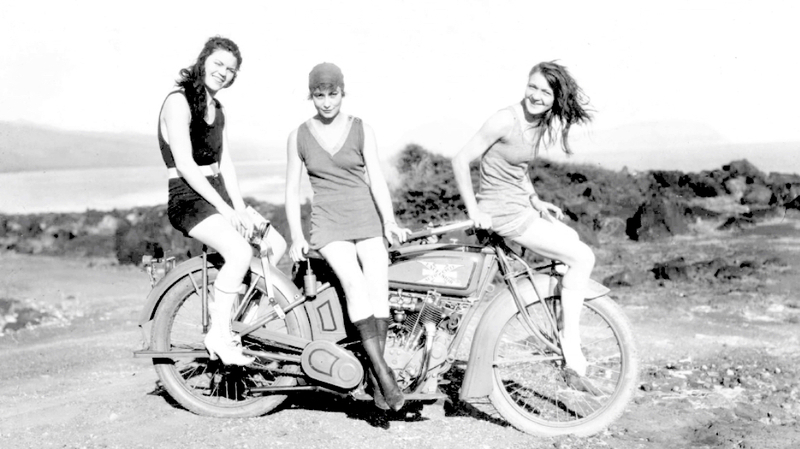 They fought hard on the dirt tracks, race tracks, hill climbs, and sales floors, and in their 1920s heyday, the competition between the Big 3 made for the most exciting racing anyone had ever seen, between the fastest and most advanced racing bikes in the world. Sales floor competition made each company improve their products dramatically, and by the late 1920s it was Indian and Excelsior-Henderson who dominated the 45cu” (750cc) market with the Scout and Super X models. Their big models (the Indian Chief and 4, and the Henderson 4) were admired the world over, and were in many ways the most attractive and technically interesting motorcycles built in the USA. But larger forces were at work in the marketplace, far beyond any company’s control, that determined the fate of the Big 3. Harley-Davidson, Indian, and Excelsior-Henderson all nearly succumbed to the Great Depression. Their sales figures after October 29, 1929 were dismal, and instead of selling tens of thousands of motorcycles towards the end of 1929, they sold bikes by the tens and hundreds, while unsold stock languished in distribution warehouses. Drastic action was necessary; Harley-Davidson found cash in Japan, selling their old tooling and leftover parts supply to make Rikuo motorcycles under license, a deal arranged by their Japanese importer Alfred R. Child. It’s still little known that the ‘Dabbitoson Harley Motorcycle Co. Japan’ was the secret savior of the Screaming Eagle. As for Indian, E. Paul DuPont decided he’d rather double down and buy a majority stake in the company than see his family’s six-figure investment go down the drain (resulting in their most profitable period ever, 1930-1945). 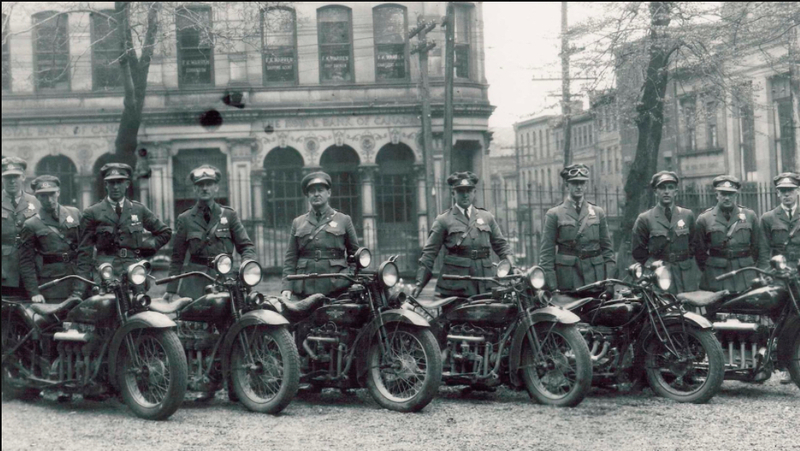 A fleet of Excelsior-Henderson 4-cylinders for this police force. At the time, a ‘four’ was the fastest thing on wheels. Excelsior-Henderson was owned by Ignaz Schwinn, whose mighty two-wheeled empire in Chicago earned most of its profit from bicycles. Schwinn correctly foresaw a major downturn in motorcycle sales for 1930, and decided to pull the plug on his big bikes, and focus on the ones without motors, which were likely to continue selling when jobs were scarce. And he was right; Schwinn bicycles outlived Indian, and thrived through the 1960s and ‘70s, but never again produced motorcycles. But the Excelsior-Henderson name has quietly survived, waiting for the right combination of capital and inspiration to roar back to life. The motorcycle industry began slowly in the USA, at the dawn of the 20th Century, but soon exploded into life, becoming a veritable Springtime of manufacturers sprouting up from the ingenuity and pluck of our native country. Hundreds of small factories emerged between 1900 and 1920, as the formula for making a motorcycle – adding a motor to a bicycle – was intuitively easy to replicate. Bicycles were at the peak of their popularity, with manufacturers like Schwinn produced hundreds of thousands per year, inventing ‘vertical integration’ by incorporating every aspect of building, advertising, selling, racing, sponsoring, and repairing under their umbrella, and becoming very rich in the process. Ignaz Schwinn was an American success story. 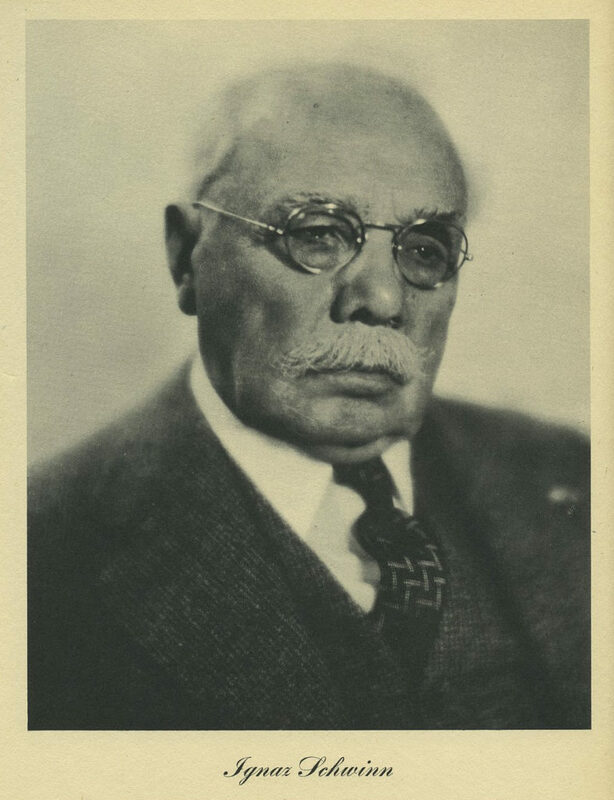 Born in 1860 near Baden, Germany, his family was mildly prosperous as manufacturers of organs and pianos, but his father died when he was 11, and the second eldest of 7 children. After a primary and vocational school education, he scoured northern Germany for work, repairing bicycles for cash. He found a job as a machinist at the Kleyer bicycle works, and burned the midnight oil on a small drawing board in his room, designing his own ‘safety’ bicycle, which had recently been invented by Stanley in England. Heinrich Kleyer approved of these drawings, and gradually Schwinn rose to the post of factory manager and designer for Kleyer’s ‘Adler’ bicycles (the factory later grew famous making typewriters and motorcycles). 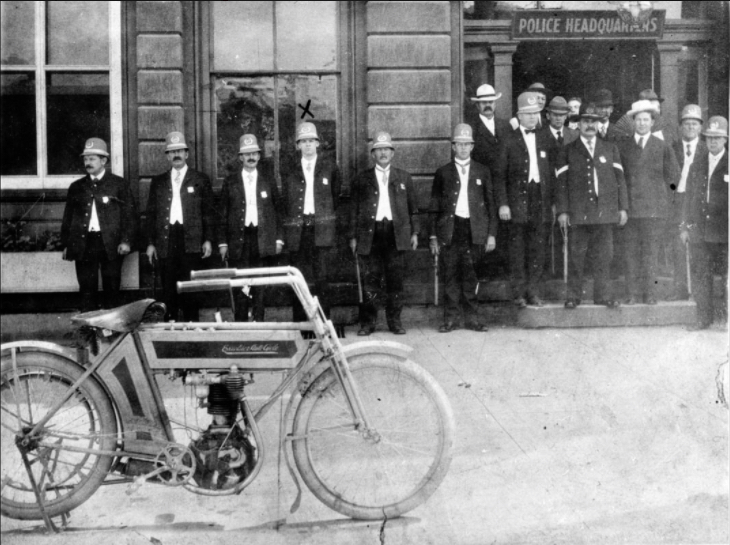 An early Excelsior single-cylinder machine with belt drive, c.1910, with the Keystone cops. 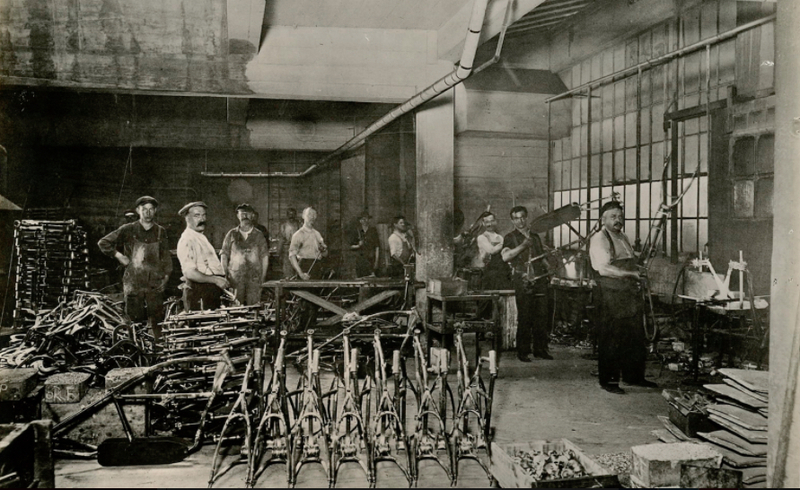 In 1891 Schwinn left Germany to seek his fortune in Chicago, the center of American bicycle manufacture. He quickly found work at the Hill Cycle Manufacturing Co, makers of the ‘Fowler’ bicycle, where once again he rose to the job of factory manager and designer. Schwinn was also involved in the launch of Hill’s related International Manufacturing Co, which produced the ‘America’ bicycle. Schwinn designed International’s bicycles, selected the machinery and tools for manufacture, and hired the employees to make them. Within a year he was supervising 237 workers, and oversaw a move to a larger factory building with 60,000sq’ of space. The frame-building room of the giant Schwinn factory [Mecum] Schwinn had made a great success of International Manufacturing, but he wasn’t happy with the management of the company, and quit in 1894. During that year, he made plans to begin his own bicycle manufacturing business, keeping an eye out for a good location, and someone who could provide financial backing. He found a kindred spirit in another German immigrant, Adolf Arnold, who owned the Arnold Brothers meat packing plant, and was president of the Haymarket Produce Bank. After Schwinn’s successful management of 3 large bicycle manufacturing firms, during a worldwide boom in the bicycle industry, the idea of him starting his own company must have seemed a sure bet to Arnold. Arnold, Schwinn & Co. was founded in 1895, with Arnold’s investment of $75,000. The company carried on doing business under that name through 1967, although when Arnold retired in 1908, Schwinn purchased his stake in the company. That year they built 50,000 bicycles, a number that would double in 3 years. Schwinn became a very large company, and even fielded a racing team in Europe to promote their brand. With so much success, Ignaz’ son Frank – an avid motorcyclist – encouraged his father to invest in the burgeoning motorcycle industry. [/caption]Schwinn’s engineers designed a motorcycle in 1910, with a parallel-twin cylinder engine, a crankcase incorporating an integral clutch, and a shaft final drive. It was a very advanced design, and at least one prototype was built, but Schwinn decided it prudent to buy an existing motorcycle brand rather than develop a new one. Dozens of small and large companies made motorcycles in the USA in 1910, and most of them struggled to make ends meet in a highly competitive market. Ignaz Schwinn didn’t have to look far for a successful motorcycle manufacturer looking to sell; he found the perfect fit right in Chicago. The Excelsior Motor and Manufacturing Co was formed as a subsidiary of the Excelsior Supply Co in 1907, with Frederick Robie as President. 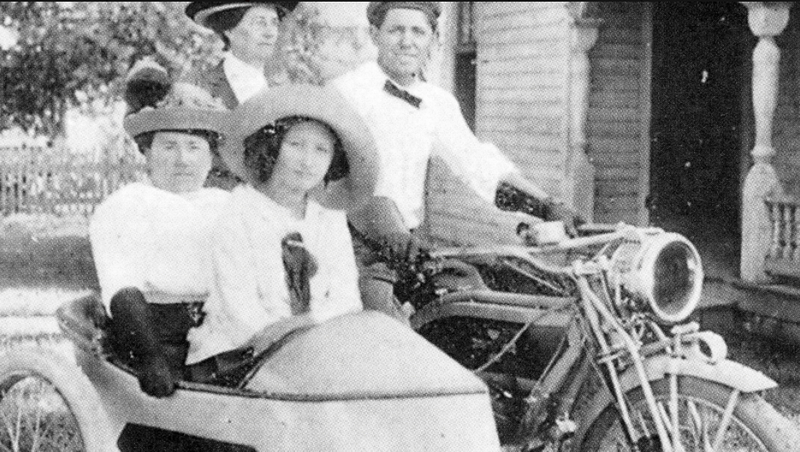 Their first motorcycle was called the Triumph(!) Model B, using a Thor engine (designed by Indian and built under license by the Aurora Automatic Machine Co, just outside Chicago), with Excelsior’s own chassis. The Triumph was a stopgap to enter the market quickly; during the 1908 model year a new machine was introduced, designed by Excelsior’s George Meiser, called the Excelsior Auto-Cycle Model A. By 1909, business was booming, and Frederick Robie hired Frank Lloyd Wright to build him a new home on Woodlawn Ave in Chicago! Unfortunately, in late 1909 George T. Robie died of appendicitis, and young Frederick (29) was left to run both his motorcycle business and the far larger Supply Co, as well as settle his father’s personal debts. 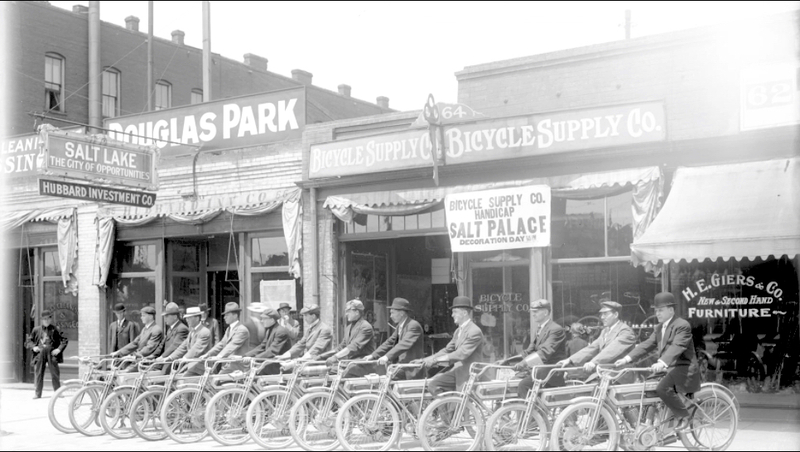 The Excelsior Motorcycle Co was booming, and could not keep up with demand, so expanded both their manufacturing premises and their product line. Extensive product lines taxed their resources, and the company was spread thin. Excelsior developed a new V-twin motor for 1910 possessing a beautiful profile, which went into full production in 1911, but the combined weight of managing both the Supply and Motorcycle companies was too much for Frederick. While the Excelsior Motorcycle Co was tremendously successful, the combination of his father’s debts and lackluster performance from the Supply Co. made Excelsior ripe for a takeover. A transfer of ownership contract between Ignaz Schwinn and his former rival, the Excelsior Supply Co and Excelsior Motor and Mfg Co, was signed on Nov 14, 1911. All the assets of these companies went to Schwinn, including the factory and office equipment, motors, motorcycles, bicycles, whole or in process; all parts and stock; the goodwill and rights to brand names; all patents; and the right to manufacture and sell under the Excelsior name. Ignaz Scwhinn personally signed a check for $500,000 on Feb 1, 1912; with the mighty Schwinn name behind it, Excelsior now had the capital it needed to thrive. 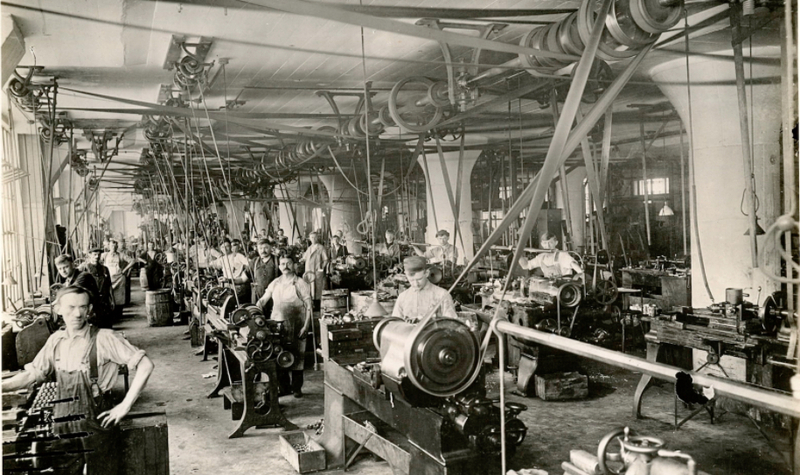 A new factory was a first priority, and the newly formed Excelsior Motor, Mfg & Supply Co built a new, 200,000sq’ factory in Chicago, the largest motorcycle plant in the world. The new big red ‘X’ logo appeared on Excelsior fuel tanks that year. The first ‘Schwinn’ Excelsiors appeared in 1915, with new, sweeping lines that presaged the streamline era of the 1920s and ‘30s. The frame top tube curved downward at the rear, creating a lower seating position and allowing the fuel tank to taper at the back, while the front fender had a curved ‘bell’ at the bottom, giving the whole machine a masculine grace. Excelsior’s new ‘big valve’ engine proved faster than its rivals on road and track, and they introduced a Lightweight model with 221cc motor for new riders. Despite difficult economic conditions during WW1, Excelsior flourished, and Schwinn looked to expand his product line to include four cylinders. 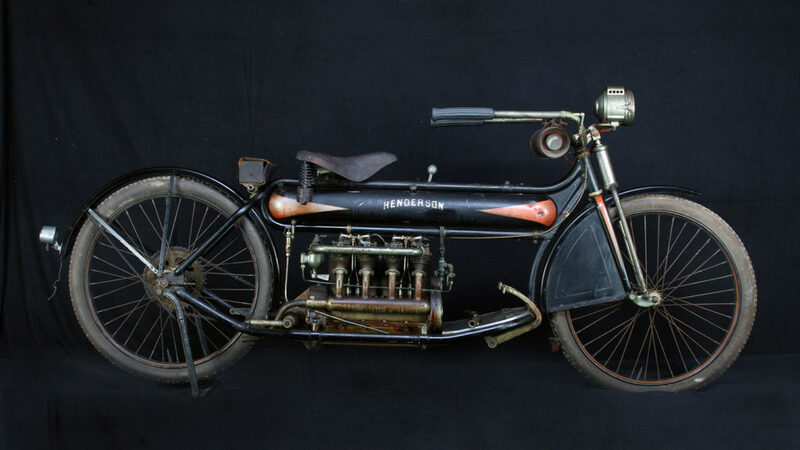 By 1917 the Pierce Motorcycle Co was long gone, and only Henderson built 4-cylinder motorcycle in the USA. William Henderson should have been the inheritor of the Winton automobile factory, as the grandson of Winton’s founder and the son of the Thomas Henderson, Vice-President of Winton. Young William dreamed of two wheels though, and sketched dozens of drawings for a new four-cylinder motorcycle, which he ran by his engineer father for approval. Years of back-and-forth ended with a blueprint for a complete 4-cylinder motorcycle in 1909, detailed to the last nut and bolt, which his father could not criticize. 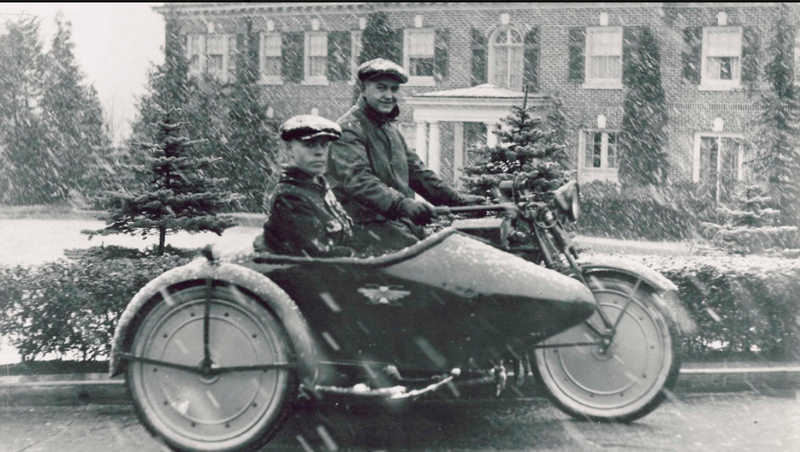 His father advised him to quit the idea, as he knew the difficulties of manufacturing and selling a vehicle, but chose an unusual parental strategy, giving William enough money to build a prototype in hopes the difficult process of building a motorcycle from scratch would deter his son. It took over a year to for Tom to turn his blueprints into casting patterns for frame lugs, crankcases, and cylinder heads, but by 1911 the prototype was complete, and it worked very well. The first Henderson motorcycle was a unique long-chassis inline 4-cylinder machine, with single-speed direct belt drive, and built-in seating for two on its long chassis. 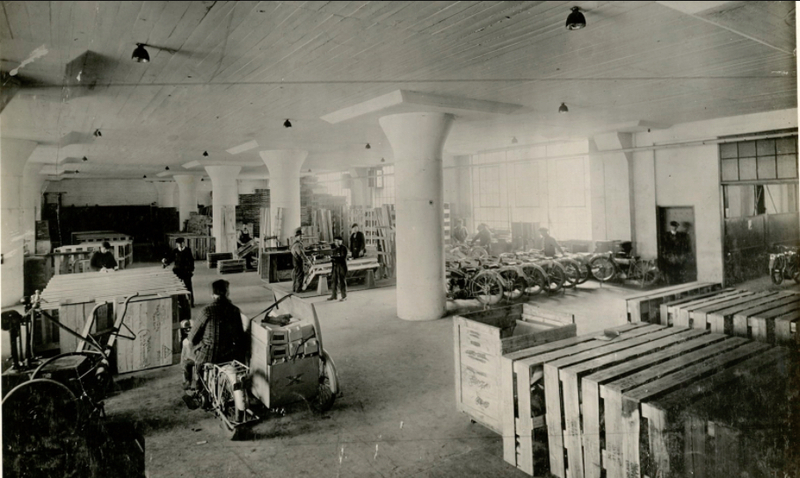 Production by the new Henderson Motorcycle Co began in 1912. William was joined in forming a business by his brother Thomas, and with their father’s help, they found $175,000 of capitalization to begin production. After setting up a factory in Detroit, the first production Henderson motorcycle emerged in January 1912. The engine was a four-cylinder 57cu” (934cc) F-head with a single-speed chain drive and clutch, which was started by a folding hand crank – shades of Winton practice. Beside the 4-cylinder motor, the most distinctive feature was that very long chassis with built-on passenger seating, with a short leading-link front fork, and a lovely ‘torpedo’ fuel/oil tank, which was used for one year only. The Henderson was a lovely machine, beautifully built, and expensive at $325. 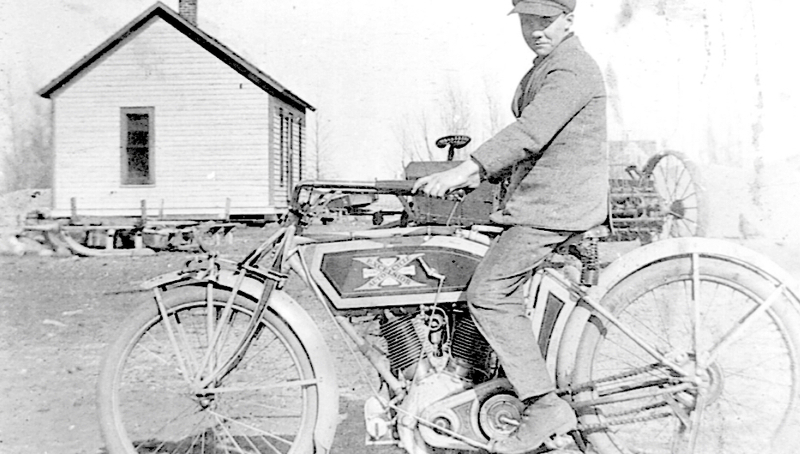 The new Henderson was an immediate international news item, as Charles Stearns Clancy set forth on a new Henderson in October 1912, intending to becoming the first motorcyclist to circle the globe. Clancy made money as he traveled by selling stories to the press; thus, everyone within reach of a newspaper knew about the Henderson motorcycle, a tremendous global PR coup. By 1915, Henderson gained a 2-speed rear hub, and by Spring a much shorter wheelbase was available as an option, at 58” instead of the original 65”, in an effort to bring the Henderson more in line with other manufacturers’ dimensions. In 1916, Roy Artley rode a Henderson with sidecar 706 miles in 24 hours, for a new world record, adding 122 miles to the old record, and on the other end of the performance scale, E.L. Hals of Modesto managed 104.2 miles on a gallon of gas with his ’16 Henderson. Alan Bedell used a ’17 Henderson to lop 4 days off ‘Cannonball’ Baker’s fastest cross-country ride, making the LA-NY trip in 7days, 16hours, and 15minutes. 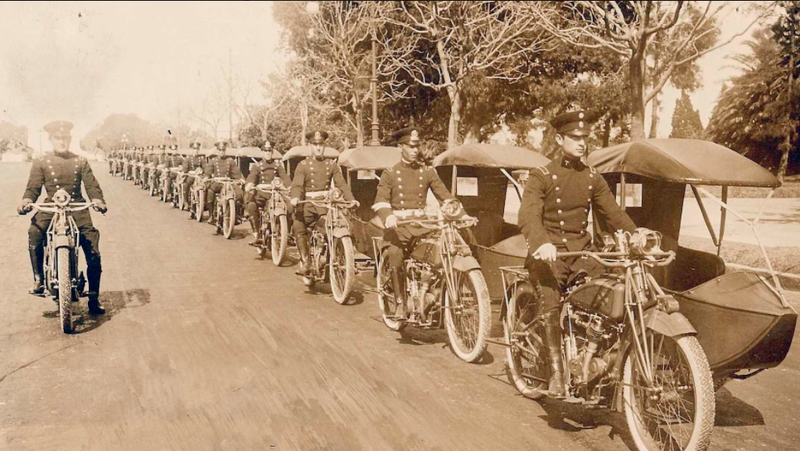 Police departments and gentleman riders appreciated the quiet quality of the smooth 4-cylinder, although behind the scenes, the factory was struggling mightily with problems of inflation brought on by WW1. The 1917 model range (the Model G), announced in Sept. 1916, had a 3-speed gearbox, the ‘short’ frame, a proper kickstarter, stronger forks, and a new induction tract, which fed the cylinders more efficiently, and generated more power. Full electric lighting was offered, and even Henry Ford bought himself a Henderson! But the company had yet to turn a profit, and as honorable men, William and Thomas Henderson decided to sell the company. The Henderson brother had been manufacturing their own design of motorcycle for six years, and their 4-cylinder machine was globally acclaimed as a superb design. 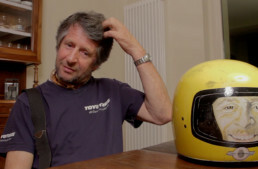 The Henderson men were still relatively young – Tom was 46, and William just 36 – and would continue to be involved with the motorcycle industry for years to come. In 1917, Ignaz Schwinn looked to expand his motorcycle business, and thought a 4-cylinder lineup would complement his line of singles and v-twins nicely. It wasn’t known until the 1990s (and is still little-known today) that under Schwinn’s direction, Excelsior drew up plans for a 4-cylinder motorcycle. Plans dated March 1917 designated it the Model O, which featured a sidevalve engine (rather than Henderson’s ‘pocket valve’ IoE motor), 3 speed gearbox, and a shaft final drive – a mix of Pierce and Henderson’s best ideas. But in a repeat of his successful 1911 tactics, Schwinn surmised it would easier to start production of a four using an established design. 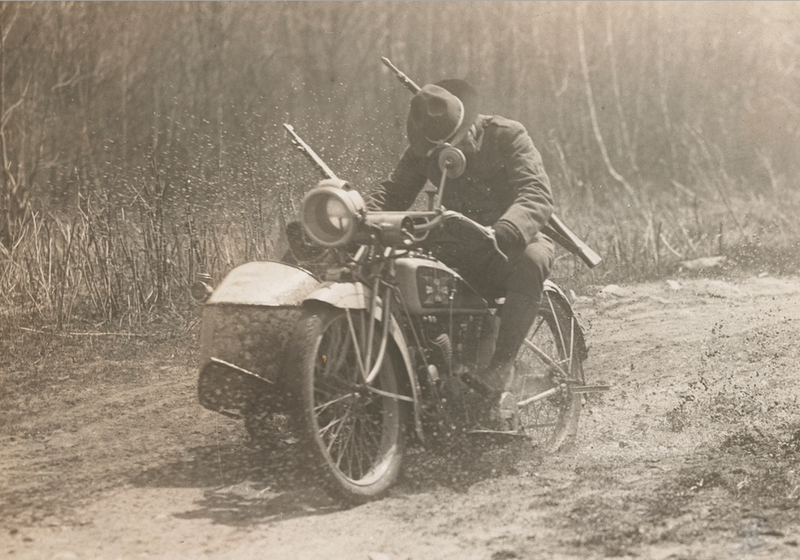 There was only US company making ‘fours’ in 1917; the Henderson Motorcycle Co of Detroit. Although the Henderson brothers built the ‘Deusenberg of Motorcycles’, they’d yet to turn a profit. The company had several suitors, but on Oct 1, 1917, Thomas Henderson (president of Henderson Motorcycle Co), gave a financial statement to Ignaz Schwinn. It showed assets of $284,693.39, and liabilities of $288,091.71. The proposed sale of the Henderson Motorcycle Co. included 200 shares of Excelsior stock for Tom, and a position as general sales manager at $10,000/yr for 5 years. Schwinn merged his two brands as Excelsior-Henderson, and began making changes in earnest. 1917 was an exceptional year for the newly integrated Excelsior-Henderson brands. Wells Bennett, a specialist in cross-country endurance racing, rode a Henderson 4 to lop 4 hours off ‘Cannonball’ Baker’s LA-NY record, once again proving the remarkable reliability of Henderson’s design. The Excelsior Lightweight was dropped from the line, to focus attention on further developing the Henderson 4, so the Excelsior-Henderson model line now consisted of a big v-twin and a four. The heat in American racing was truly turned up when Harley-Davidson officially entered the fray, fielding a team of professional riders for the first time. They took a leaf from Indian’s technical book and introduced their own 8-valve racer, and the intense competition between factories created the first Golden Age of American motorcycle racing. Excelsior had an excellent design, which required little development to be very fast, but the factory’s attention after 1917 was on the Henderson, the only four-cylinder motorcycle produced in the USA between 1911-21. World War 1 and the ensuing inflation of wages and materials cost shook out most motorcycle manufacturers, leaving the Big 3 to duke it out: Excelsior-Henderson, Indian, and Harley-Davidson. Schwinn knew Excelsior needed a boost in racing, and while the Henderson was excellent for long-distance events, it was no dirt-track/board-track racer. Excelsior developed an OHC v-twin design in 1919, based closely on the Cyclone design, and built 6 engines for the 1920 season. But changes to the racing rules (to limit speeds and increase safety) spelled the end of the Board Track era. 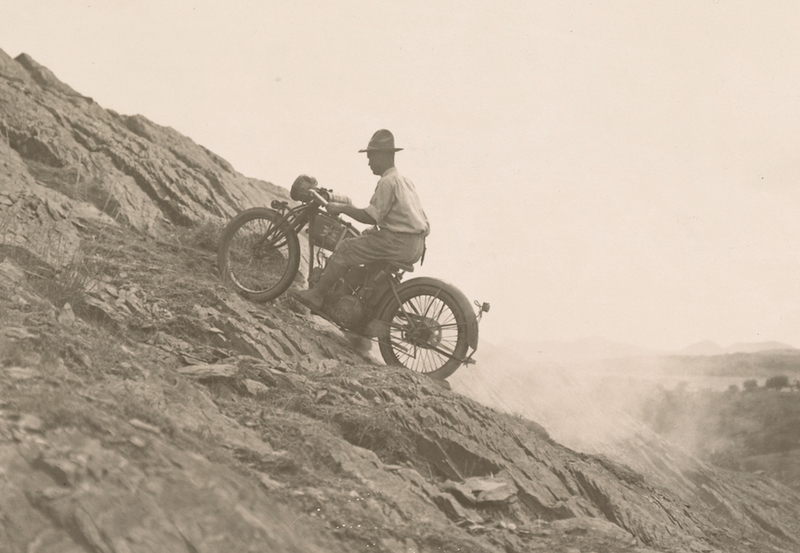 Hill climbing was on the ascendant – the practice of ‘vertical drag racing’ up freakish hills across the country – and Excelsior Big Valve racers proved very much suited for the practice. Long-distance racing and hillclimbs were Excelsior-Henderson’s biggest source of advertising copy in the post-WW1 period, as well as international racing, with wins in South Africa, Denmark, and France. 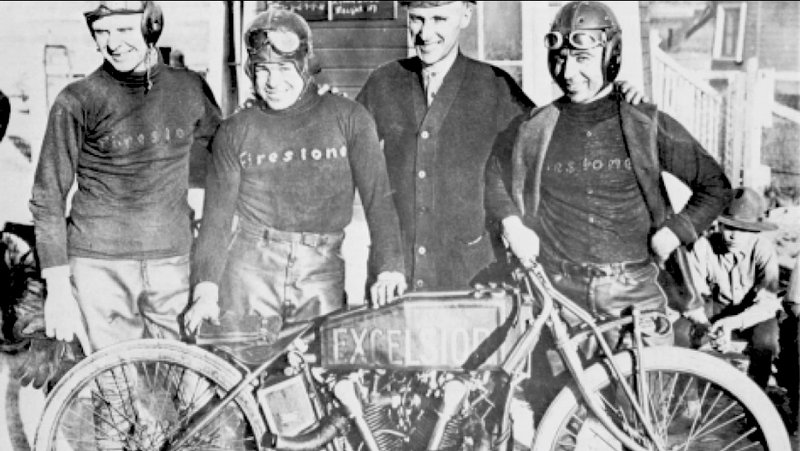 Short-track racing with smaller 500cc (30.50cu”) motors was gaining popularity, and Excelsior adapted its Model M racing v-twin motor into a single, and took records on tracks across the USA. But the sport of Hill climbing really attracted the crowds, growing enormously popular as the decade progressed. 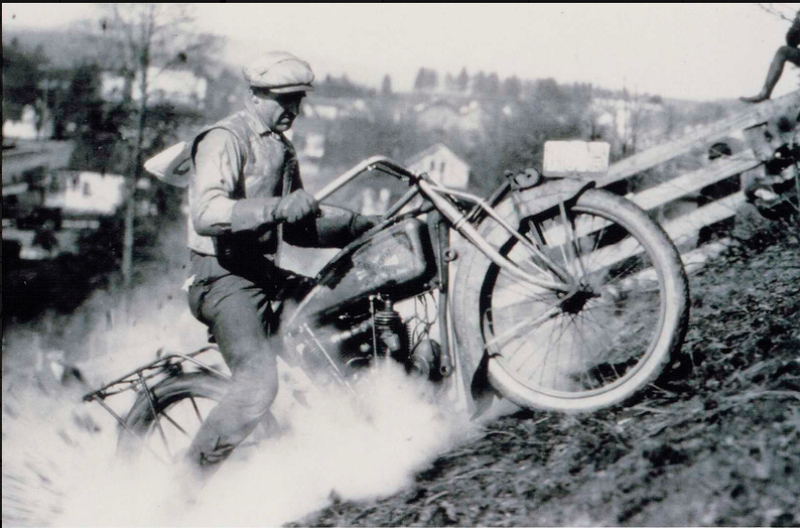 30,000 spectators watched the Capistrano Hill Climb in San Francisco in 1922, where Wells Bennett’s Excelsior bested local favorite Dudley Perkins’ H-D. The following year, 40,000 people watched as Ed Ryan on a very special, long-wheelbase 80cu” Excelsior Model M racer won the Open class at Capistrano, besting the factory-sponsored efforts of Indian and H-D. The era of the ‘slant artist’ had begun. Hendersons gained a new sidevalve motor, based on Schwinn’s original Model O design of 1916, and all models had 3-speed gearboxes. 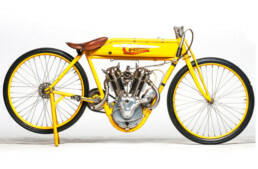 The finish and quality of construction of the Hendersons earned the name ‘Deusenberg of Motorcycles’, and they continued to win long-distance events before the sanctioning body of racing – the M&ATA Competition Committee – stopped certifying cross-country record runs as ‘outlaw events’. 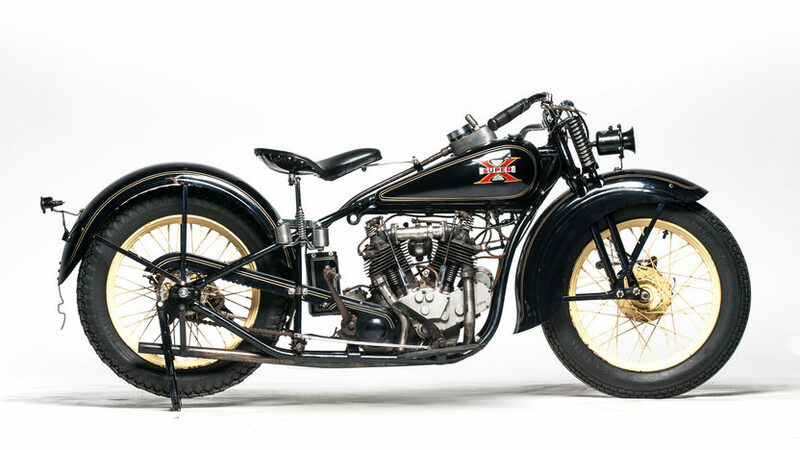 Excelsior made a strategic move in 1925, and introduced the new Super X as a 45cu” (750cc) v-twin into a vacant gap in the American marketplace. Indian produced the 600cc Scout model, which was popular, but adding 150cc made the Super X faster than the Scout, and nearly as fast at the 61cu” H-Ds and Indians. The Super X was light, handled very well with a double-cradle loop frame, and had a good turn of speed. It was easily tuned for racing too, and changed the American motorcycle marketplace for decades to come. Suddenly the 45cu” class was popular with riders, and while it was easy for Indian to add engine capacity to the Scout, Harley-Davidson needed a totally new design to compete, which didn’t appear for another 4 years (the Model D). In 1929, the Excelsior-Henderson line was transformed with the new Streamline series. Rounded teardrop tanks and lower riding positions gave a thoroughly modernized appearance, and performance of the Henderson 4 was greatly improved with input of former H-D staff Joe Petrali and Arthur Constantine, who’d joined Excelsior-Henderson on the design team. The Henderson KJ model had 31hp, and was capable of 100mph, satisfying the many police departments using 4-cylinder pursuit motorcycles. One the competition front, Joe Petrali had won the 1928 Hillclimb Championship on a Super X, but competition was heating up with Indian and H-D developing very special racers. In response, Petrali and Constantine built a series of experimental racers, including an OHV version of the Super X (designed with Andrew Koslow), that developed 50hp on alcohol. In the Unlimited class, they built several ‘Big Bertha’ racers using 61cu” motors and IoE cylinder heads. Petrali won 31 competitions in a row with his Big Bertha, and won the Championship again in 1929, and in 1930, Gene Rhyne took the Championship for Excelsior once again. In the earluy 1990s, motorcycles were booming in the USA, especially the heavyweight cruiser market. There had been only one major motorcycle producer since 1955 (Harley-Davidson) and it seemd to Daniel Hanlon the time was ripe for competition. 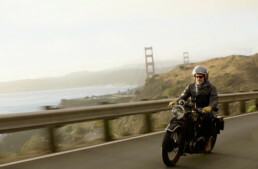 He secured the name and rights to produce another great American motorcycle brand, Excelsior-Henderson. The British firm Weslake Engineering had developed a sophisticated DOHC four-valve fuel-injected v-twin motor, which had been race- and road-tested extensively; it was technically far in advance of the pushrod OHV v-twin H-D produced, as well as being far more powerful. Excelsior-Henderson secured the rights to produce this engine, and hired Weslake to develop it for the needs of a big American cruiser. 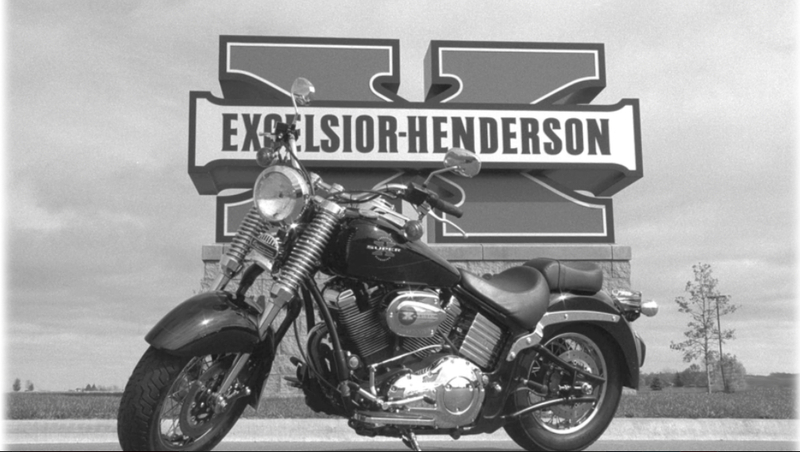 The Excelsior-Henderson revival machine, c.2000. Big and brutish and meant to last. Hanlon’s intention was to build a ‘100-year bike’ of tremendous durability and built quality. His team designed a chassis to echo the original Super X, using a ‘springer’ fork of modern design, and by 1996 the new Super X prototypes were displayed and ridden at the enormous Sturgis Rally. That year a new factory site was chosen in Belle Plain, Minnesota, and more factory prototypes were presented at Daytona Bike Week and again at Sturgis by 1997. The new engines proved ‘bulletproof’ and employees of the company took great pride in the Super X, which finally began production in December 1998. 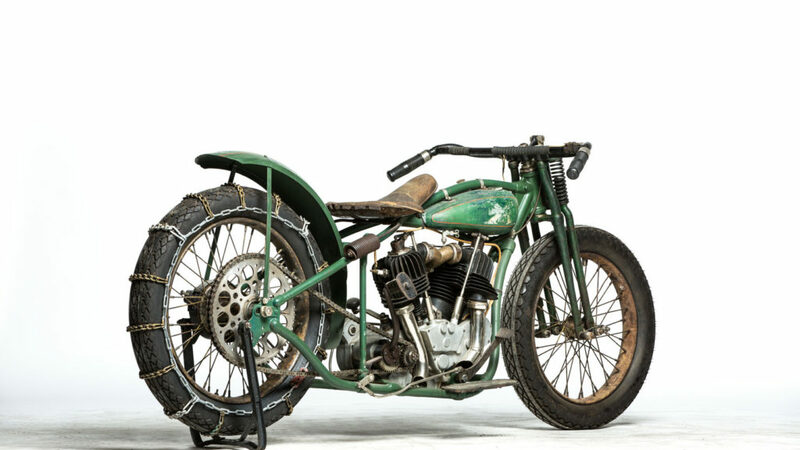 The first 30 machines were ‘demonstrators’, again sent to large motorcycle events around the US, where test rides were offered, to near universal acclaim for the Excelsior-Henderson’s acceleration, handling, and braking capabilities. It was a Super Cruiser, and found an immediate and passionate cadre of buyers. Nearly 2000 machines were built, but the Dot-Com bubble bursting in 2000 created fear in the investment and banking markets, and Excelsior-Henderson could not secure a new round of funding to continue production, let alone expand the product line. To the great disappointment of a growing legion of fans, Excelsior-Henderson stopped production in 2000. 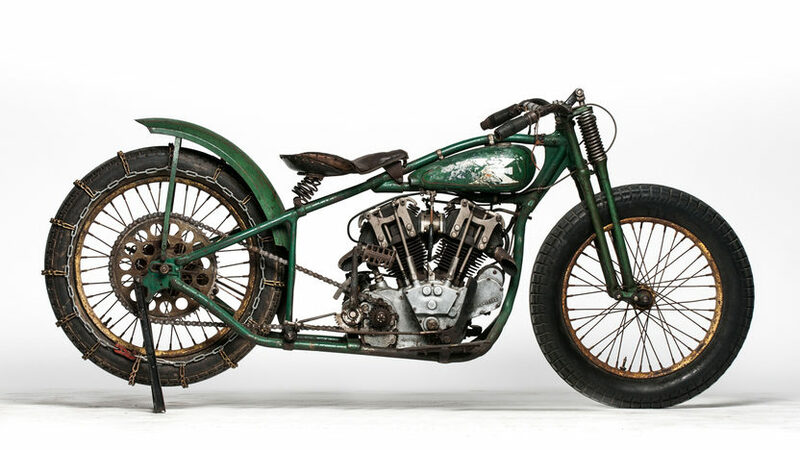 That Excelsior-Henderson built motorcycles in these numbers, and with such success, speaks volumes about the enthusiasm in the American motorcycle market for heritage brands. Polaris recently invested in exactly this direction, dropping its long-established Victory production in favor of the new Indian line…and is reaping the rewards, with sales of the new machine already outstripping the Victory line. Now there’s a historic opportunity to bring back the Big 3, a tremendously exciting prospect. Mecum auctions is selling the brand and all intellectual property during their huge Las Vegas sale, on Saturday Jan 27th [follow this link]. I predicted in my most recent Cycle World column (‘There Goes My Hero’) that the brand will likely go to an Indian mega-brand like Mahindra, TVR, or Hero, as they’ve been on a buying spree of defunct motorcycle names in the past few years, like BSA, Jawa, and Peugeot. Will Excelsior-Henderson be made in India, or the USA, or both? It will be a very interesting auction in any case, and we’ll follow the story! ‘American Excelsior: the History of Excelsior, Super X, and Henderson Motorcycles, by Thomas Bund and Robert Turek (American-X Archive, 2016). The only book currently in print on the whole history of the Excelsior-Henderson brand. ‘Schwinn Bicycles’, Jay Pridmore and Jim Hurd (MBI, 1996). Great history on the early years of Schwinn bicycles, with a few pages devoted to motorcycle and auto production. ’50 Years of Schwinn-Built Bicycles’ (Arnold, Schwinn + Co, 1945). An in-house publication with a great story of Ignaz Schwinn’s early years, and the development of the bicycle as we know it. ‘No Hands: the Rise and Fall of the Schwinn Bicycle Company,’ Judith Crown (Henry Holt + Co, 1996). An orientation on the bicycle industry and the history of Schwinn from a business perspective, including the disastrous mis-handling of the brand in the 1980s.